$46,070 Base price is $38,850. With options like blind spot monitor, high intensity discharge headlamps, a power rear sunshade, luxury package, hard disk drive navigation system, intuitive parking assist and other goodies, the final price was $46,070.00. What a delight. Strong and responsive acceleration in this 2.5 Liter dual cam in line 4 cylinder engine hybrid system sporting a 200 horsepower. 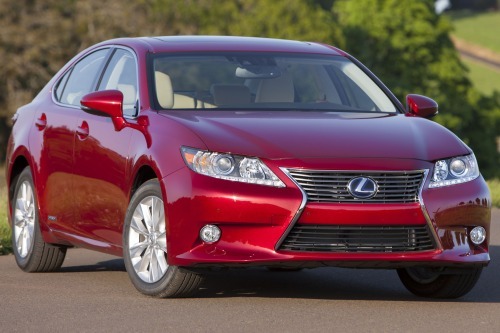 Though the responsiveness seemed just a bit delayed and loose compared to other Lexus models. This car exudes quiet luxury and is a pleasure to drive on hills and on highway. A 200 horsepower hybrid system that includes a 2.5 liter dual cam in line four cylinder engine with a high output permanent magnet electric drive motor powers the ES 300h. It accelerates quietly, effortlessly and with considerable vigor--more than we've seen in some other luxury hybrids. This hybrid delivers 40 mpg city and 39 highway. Nice on the wallet and far surpasses most vehicles of any class, family or brand. Fuel economy rating is 40 miles per gallon combined, with 40 city/39 highway ratings. Annual fuel cost is a modest $1,350 a year based on $3.55 a gallon gasoline and 15,000 miles of driving. And you'll save a healthy $4,850 in fuel costs over five years, compared to the average new vehicle. This car fills your senses - really. from the powerful, handsome exterior and new grill to the style, design, colors, finishes and touch points inside. Even without the "Luxury Package" this model at $36,800 is a delight. The upgraded version we drove with the bamboo wood trim and accent lighting PLUS and overall very good vehicle with all the Lexus signature attributes. Reliability included. Size and spaciousness is expanded in this year?s model with 4" of additional legroom for rear passengers. This newest generation of ES300 is miles away from previous models, which, while thoroughly nice cars, seemed a bit....old. Not the 2013 version. Everything about it says up to date, fresh, and youthful. That's a big change in tone for this model. Safety is Lexus?s middle name. Airbags in all the right places - head, body, knee and rear seat mounted ones to boot. Vehicle Stability Control, 4 wheel ABS system, one-year and Enhanced Roadside Assistance subscription. Smart Stop Technology and Automatic Collision Notification provide tremendous assistance to driver. All you could ask for and more. You get a host of airbags, including front, knee, front and rear seat mounted side impact airbags, side curtain airbags, vehicle stability control with traction control, electronic brake force distribution and brake assist, Smart Stop technology, automatic collision notification, emergency assist button. Lexus continues to dazzle with easy to use, practical on the road technology. Interior features that include panoramic moon roof, VAN system, handsome and tender to the touch wooden dash, Home Link customizable garage door opener, push-button start and fabulous, kick-it-out-8-peaker stereo with a six-disc CD changer. Standard are USB ports and satellite radio. Our amped up model had the driver assist parking sensors, backup camera, and blind-spot monitoring system - which are a lifesaver. Not quite sure we understood the rational, but the base model doesn't include Bluetooth ? pretty intentional safety and convenience miss for a car of this magnitude. The Lexus Enform allow access to a lot of mobile apps, including Open Table, Pandora, Movie Tickets, and others. See HIS comments for the Drive Mode Select - weather was cooperative, but could not discern between the various performances. Lexus, an industry leader, offers cutting edge customer attention for those that have questions regarding the vehicle. Make an appointment to talk to the . This is the go-to person at your dealership that will talk you through the customization that YOU need. Use the human resources that are available to you, so you know how to use this wonderful vehicle. First, there's the Lexus Enform App suite which employs your smart phone to allow access to a lot of mobile applications, including Open Table, Pandora, MovieTickets.com, iHeart Radio and a host of others, and you'll be able to update with new apps pretty easily. Other technology includes a Drive Mode Select knob allowing you to choose among Eco (Economical) driving, Normal, or Sport. The changes in driving personality however, aren't as pronounced with this system as I've seen on other cars, so don't expect dramatic changes among the modes as you use them. There's also a blind spot monitor with rear cross traffic alert. Love, Love, Love the new grill design and look. An edgier Lexus, indeed. The 17" alloy wheels, LED lights and entire design language transforms the car and expands and intrigued buying audience. For my money, this was a highly successful styling redo for Lexus. The semi-fastback roofline, the aggressive looking new wheel designs, the lower looking profile, and the whole contemporary, understated ambiance suggests a thoroughly modern luxury car without all the nonsense seen on some competitors. And I have to differ with some of my journalist friends. I think the spindle grille is outta sight, and is one of the most easily indefinable, sexiest grills around. Don't change a thing, Lexus! Inside, there's a cool, elegant, horizontally organized dash with some interesting contours and details, and of course, the Lexus Remote Touch device for using the Navigation and other systems is one of the best in the business. The clock face and gauges all have a sleek, tastefully trimmed custom look to it, and the whole thing says, "I'm different. Pleasingly different." Proves you don't have to have a complex look and thousands of buttons to suggest luxury. By the way, the hybrid has aesthetic and other features all its own. There are bamboo accents on the steering wheel and elsewhere. Blue tinted emblems and markings are used to distinguish the ES Hybrid, which is the first such model for this line. Around back, you'll see a rear valance that is extended to conceal the exhaust system, along with a rear spoiler. 4 year/50,000 mile , as well as a six-year/70,000 mile power train warranty. 72 month corrosion warranty is included, regardless of mileage. Four year, 50,000 mile basic warranty, 5 year, 70,000 miles powertrain coverage, 8 yr,/ 100,000 mile hybrid battery components warranty. 24 hour, 365 day a year roadside assistance plan, complimentary first and second scheduled maintenance services, and lodging for emergency breakdown 100 miles away from home.